Driving through the Columbia River Gorge it hits you that over the course of thousands of years, the landscape was carved from the earth creating the majestic beauty. Then you realize you need to keep your eyes on the road. The gorge's unending beauty is only matched by the rich history and lessons it can teach people willing to learn. 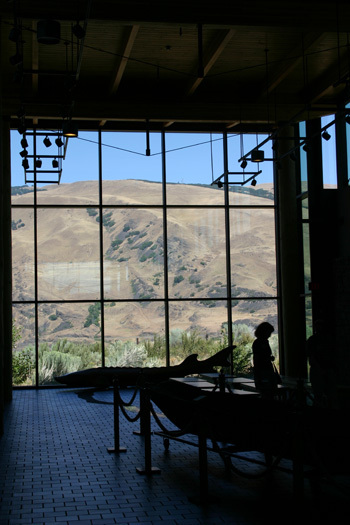 Lucky for us, there is the Columbia Gorge Discovery Center and Museum in The Dalles. The center, located outside of The Dalles along the Columbia River and highway 84, sits on a 54-acre plot and houses 48,200 square feet of exhibit halls, meeting rooms and an auditorium, museum store, café, research library and workrooms. You can spend hours reading and learning about the rich history of the gorge - from the how it was formed, to the wildlife and native tribes that inhabited the area. There is even an area where people can try out a little wind surfing - without getting wet. Along the floor in the main entryway is a map of the Columbia River showing where towns are located and the winding nature of the largest river on the West Coast. Of course there are also canoes and other exhibits in the main hall - with each side of the building dedicated to either the museum, on the right, or the gorge discovery center on the left. Making a day at the center is easy to do if you want to spend time learning as much as possible about the area. The Basalt Rock Café provides a nice spot to read or grab lunch, prices are reasonable and the food is standard lunch faire. There is seating indoors or outside - but be warned that during the summer The Dalles can reach temperatures topping 100 degrees. The start of the gorge exhibit is covered in basalt rock - called columnar basalt - which can be seen throughout the gorge. TV screens give you the history of how the gorge was formed and theories to its origin. The tour starts with the geology, and it makes you understand how the wonderful vistas and rock formations were created. There are even tips for kids throughout the exhibit at their eye level. The same treatment is given to the weather, wildlife, wildflowers, Indian tribes and the Lewis and Clark expedition throughout. The final section of the center has a large explanation about the Cascade Locks and how the dams were built. They even have an old automobile in the hall to show what travel was like. This summer "Cargo" was being featured in the entryway - showing how cargo was brought by pioneers exploring the area. A huge exhibit welcomes you as you come in with a pile of cargo on logs that were used to traverse the river. Each year about 57,000 visitors from around the country walk through the halls and learn about one of the most incredible views on the west coast. Opened in 1997 the $21 million facility is designed to inspire appreciation and stewardship of the Columbia River Gorge and Wasco Country through collection, preservation, and interpretation of cultural and natural history resources. With more than 18,000 square feet dedicated to exhibits interpreting the cultural and natural history of the area there is plenty to learn, see and read when visiting. What to bring: Cameras are allowed in the center and it is indoors and climate controlled. There are paths and walking trails on the site - so make sure if you are going on a walk to dress accordingly. Season: The center is open seven days a week from 9 a.m. to 5 p.m. They are closed on New Year's Day, Thanksgiving Day and Christmas Day. General admission is $8 for adults, $7 for seniors, $4 for children between the ages of six and 16. Children five and under are free.